Who says just because we are fasting, we can't think of food? Kolachi reviews some of the places that will provide the most delicious relief after a long day of fasting, and battling the Karachi heat and traffic! "In the spring, a young man's fancy lightly turns to thoughts of love," says Lord Tennyson. In Ramadan, fasting Karachiites' thoughts massively turn to food. The hectic pace that the city forces upon the citizens, and they choose rather acceptingly all year, becomes slightly more tedious when one is not fuelled by the usual supplies of caffeine, Karachi Haleem and nicotine. Manicured lawns, well maintained streets, roundabouts and planned neighborhoods set Latifabad apart from other areas in Hyderabad. Kolachi pays a visit. Latifabad was named after the Sindhi Sufi poet, Shah Abdul Latif Bhitai. Established around 1954 as an extension of Hyderabad, it was built along with Qasimabad to house migrants after the Partition. Many of today's British parliamentarians are known for their holier-than-thou attitude and seldom let an opportunity pass to lecture developing countries like Pakistan on morality and human rights. Relatively few British parliamentarians, however, question the human rights record of their own country. Most of them, especially those belonging to the ruling Labour Party, continue to look the other way when confronted by evidence of horrific human rights violations by British forces in Iraq and Afghanistan. 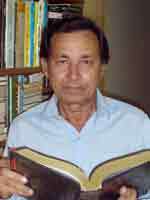 Javed Mujadaddi was born in India, in 1954. He migrated to Pakistan when he was 10 years old, and has lived in Karachi ever since. Javed has lived his life exactly the way he wanted to, working at jobs he enjoyed, and strived to gain experience and knowledge every step of the way. He tends to go with the flow and has always taken life as it comes, all the while keeping an eye on the things he considers very important. He counts himself lucky as he has made "real friends" from all walks of life in Karachi, who have helped him ease into his skin even more. However, sad as giving up the traditional lunch hour recuperation might seem to those working, or the occasional tid bits those at home snack on while going through daily chores, the concept of Iftar breathes a whole new life into the act of dining. The Iftar spread differs from regular food on many counts. It feels more important as it is one's first meal after a long day, and that one meal becomes that more special as most families tend to sit down together to eat during Ramadan whether they do so during the rest of the year or not. There are certain kinds of food one associates with Ramadan, the delightfully greasy pakoray, and hot, spicy samosas please the taste buds more than ever when consumed at iftar. Even breakfast gets a whole new spin at sehri, with the traditional khajla, pheni, and parathas being broken out and eaten like never before. The trend to turn both Ramadan mealtimes into an opportunity to socialize has peaked over the last few years, which is a reason of great happiness for those in the restaurant business. Other than restaurants, certain places in the city have garnered quite a reputation for being the best producers of common Ramadan fare. As with all professions, some do it better than others, and Kolachi has taken it upon itself to point out the best places to fuel up with mouthwatering food at the beginning and end of each roza. The corner of your street! Having pakoras at iftar is a must for most of the Karachiites who cannot imagine breaking a fast without pakoras. The traditional pakoras made of a slice of potato or a bunch of onions, chunks of spinach, cauliflower floret, or even slices of aubergine, coated in a mildly spiced, turmeric colored batter, and then deep fried served with mint and tamarind chutnis is a treat for the fasting. Naureen, a house wife makes pakoras religiously at iftar every day and cannot imagine breaking a fast without a dish full of the snack, says, "I wonder what Ramadan would be like without pakoras," adding that she prefers the snack not only because it tastes good, but is, "easy and time saving to cook." Pakoras are easily available at every other vendor or shop selling snacks for iftar. "This is the most saleable item during Ramadan," Shakeel tells Kolachi, while frying a handful of pakoras in a deep pot at a shop in Saddar. Around 10,000 to 15,000 people depend on churning out pakoras for a livelihood in Ramadan reveals Shakil adding that the sales of pakoras increase by 50 per cent during Ramadan. "Prices for pakoras range between 100 rupees and 1200 rupees per kg with a profit margin of between 50 to 60 per cent," says Amjad who makes pakoras outside a sweetshop in North Nazimabad. According to Amjad this snack is so in demand during Ramadan that he starts preparing it at four pm and all his pakoras are sold out well before iftar. Remember those days a long, long time ago when one would stand for two hours in long queues waiting for a table at Pizza Hut, at sehri as well as iftar? Although there is a wider range of places to pick and choose from now, those queues still form outside Pizza Hut every Ramadan. Apart from being economical, with the new sehri and iftar deals being priced at below 500 rupees, Pizza Hut still hasn't lost its touch when it comes to quality. The pizzas are served piping hot, and are the perfect blend of cheese, yummy sauces, and vegetarian and non-veg toppings! So pay Pizza Hut a visit this Ramadan, as the pizza "has only gotten better with time!" according to one fan. A thick liquid of flour and yogurt fried deep in circular shapes and soaked in thick, sweet sheera, is a much loved confectionery served at almost every Karachiite's iftar table. Sold at prices ranging between 80 rupees to 200 rupees per kg, freshly fried hot Jalebis are a delight for the fasting, as "they are sweet enough to help regain lost energy," says Muhammad Jamil, 50, who loves it either served warm or cold. Though the sweet is thought to have originated in the North of India, it is equally loved in Pakistan, and some of the most delectable Jalebi can be found in Delhi Colony, and Sohny Sweets in Clifton. The quickest and cheapest option when it comes to eating out any day would be McDonalds, and with all the deals being bounced our way during Ramadan, McDonalds offers deals that seem to beat all others, at least when it comes to prices. Located in almost every district of Karachi, the best thing about McDonalds isn't just the big, thick burgers, although they are pretty good. The burgers come with fresh, crispy fries, and a variety of hot and cold desserts are at offer as well. Top it all off with a frothy McDonalds shake and you have a well-rounded iftar, which is not too heavy on the pocket. Dahi Phulki and Channa Chaat are snacks the absence of which might dull the iftar experience for many. Channa Chaat, a snack made with the combination of lentil, spices and tamarind sauce served with dahi phulki is usually sold at a price of 20 rupees per plate and 100 rupees per kg, respectively. "I love the sweet dahi phulki sold here," Mustafa, 28, while pushing his way against the throng of buyers at Fresco tells Kolachi that he has travelled all the way from North Karachi to Burns Road to buy this snack. he adds that as it is usually hot during Ramadan at Karachi, this yogurt made snack refreshes him "either made at home or bought from the bazaar, I can't imagine breaking a roza without dahi phulki," Mustafa admits. The most successful restaurant in Karachi has to be BBQ Tonite, and for good reason. The food, though a bit predictable, is never bad; the service always good, and the general ambience of the place, though not sophisticated is very welcoming. As the name suggests, BBQ Tonite mainly proffers barbeque dishes, which consist of spicy, juicy tikkas and kebabs that are grilled to perfection, served with a variety of naans, plain, roghni, garlic, to name a few. Situated between Sea View and Boat Basin, BBQ Tonite usually lays out a buffet for iftar, with a fixed price for an all you can eat deal. However, one can also order individually off the menu if the buffet doesn't strike one's fancy. Deep-fried in desi ghee the protein-rich vermicelli, Khajla is almost tasteless and is usually served with pherni or pheni, a round-shaped deep-fried snack, during sehri. Dipped in milk and sugar, Khajla serves as a cereal with a single serving enough to make one feel full through out the day. Taken usually only during Ramadan, Khajla-pheni outsells the other sehri snacks at sweet-shops. "Made in desi ghee, they are very nutritious," says Haji Aslam, a halwai by profession, adding that while they sell like hot-cakes during Ramadan they are least demanded in other months. "Our customers for this snack are usually middle-aged or old people," Haji Aslam admits that this traditional snack is not valued by the young generation as is done by their parents and grand parents. "Youngsters now opt for restaurants and fast food for sehri," he says. A favorite for breakfast and random coffee jaunts, Espresso offers nicely brewed coffee, sweet, cool frappacinos, and desserts that have broken many a diet. Although their iftar menu does not differ much from the regular one (a khajoor and sharbat), it is still an ideal place to just unwind after getting through the day minus any of the rewards that involve chocolate, caffeine, sugar, and carbs of any sort! Espresso does, however, celebrate Ramadan and opens its door for sehri every day during the month, where the usual breakfast menu is offered. What better way to begin a roza but with the sugar high of pancakes and the sweet caffeine buzz of a Latte? Eat all you can, but can you? "I tried having as much as I could," Bilal, 18, tells Kolachi about a memorable iftar at a pizza place. When the restaurant offered an all you can eat for 300 rupees per head deal at iftar, Bilal along his other pizza loving friends grasped the opportunity to, well, eat all they could! "We would extract the outer crust to reduce its size," he divulges the tricks to be able to consume huge amounts of food, "and would stroll around the restaurant to make some more place in our stomach for another pizza," he admits cheerfully. Ramadan food is somehow very different from regular food, if pakoras were to be served on any other day, they would not be relished as greatly as in Ramadan. Somehow abstinence from food and drink for an entire day makes one appreciate them more, and knowing that one has such an eclectic range of food to pick and choose from while putting together the iftar feast is an oddly comforting thought. Wide streets and beautiful lawns aren't a common sight in Hyderabad apart from the posh Defence and Cantonment neighborhoods. What one mostly does get to see are congested roads and narrow streets, but Latifabad was designed to have spacious streets with greenbelts. Latifabad was one of the first Pakistani towns to be planned along modern lines and this shines through the fact that each of its 12 units has its own hospital, several schools and residential complexes. Initially the town was populated with people of mixed ethnicity, but after the ethnic riots in the '80s, most of the Sindhi population moved off to Qasimabad, while the Mohajirs settled in Latifabad. Today, Latifabad does not exclusively house Urdu speaking people and a number of Sindhi, Punjabi and Pashto speaking people reside there as well. Though Latifabad doesn't have distinguishing historic landmarks apart from the haveli of the Talpurs of Sindh, those who live there claim it to be more peaceful than other parts of the city. "People can easily walk out of their homes to get around in Latifabad as there is none of the chaotic traffic as in the rest of the city," Says Nargis Sheikh, a resident of Latifabad. Latifabad is also the home of many social services being provided to other areas of the city. Apart from several hospitals, Pakistan's largest asylum for the mentally ill, Sir Cowasji Jehangir Institute of Psychiatry, or Giddu Bander, as the locals call it, is also in Latifabad. The Board of Intermediate Secondary Education (BISE), Hyderabad is located in Latifabad as well and provides facilities to many districts of the province along with governing authority of examination and results. Mohammed Waseem, a government employee, tells Kolachi that the houses in Latifabad have dual entrances, which houses in unplanned colonies in Hyderabad do not. He says that the main roads as well as arterial roads in Latifabad are sometimes as wide as 200 feet to facilitate easy passage of vehicles and pedestrians. "The environment in Latifabad is fresher than in other areas of the city," says Waseem, "but the ever increasing encroachments and illegal extension of houses mars the façade of a very modern neighbourhood." The population of Latifabad includes people from varying economic backgrounds. As in other parts of Hyderabad, there are katchi abadis in Latifabad as well which have been regularized by the government. Despite already being a very modern and well-planned neighborhood, the local government constantly strives to improve Latifabad. A green belt is being made, parts of which have already been made accessible to the public. Railway lines running through the district are a major cause for traffic coming to a standstill countless times a day. To counter this problem, the first ever flyover in the district is being built in Latifabad, which is scheduled for completion by the end of this year. The Taluka Nazim Sabir Kaimkhani is of the view that one of the more distinguishing features of the development of Latifabad is the fact that it is spread over 204 Kilometers square, and is thinly populated, whilst other smaller, neighborhoods in Hyderabad have a higher population. "The infrastructure of Latifabad was designed keeping a population of 50,000 in mind, yet today there are around 0.5 million people inhabiting the taluka, hence there is much room for improvement," says Sabir Kaimkhani. Currently development plans are being carried, anticipating needs of the future population, and certain areas of Latifabad have been restricted to maintain the beauty of the taluka. An officer has been assigned to look after the greenbelts and the parks in the area, and more greenbelts are being developed to provide a source of healthy entertainment to residents. "Latifabad is becoming an economical hub in the district because of low traffic turnout. Commercial banks prefer opening their branch first in the taluka, and then anywhere else. The standrard of living in Latifabad is very good," adds Sabir Kaimkhani. Latifabad, like other parts of the city is now organizing construction of apartments and housing complexes, however, these projects are still few and far between. People still prefer investing in houses, and a large number of real estate schemes target at developing moderate to luxurious accommodation. "The municipal administration is carrying out development work but the pace of work should be quickened," says Aqeel Ahmed, another resident of Latifabad. He adds that encroachment at all levels should be banned and action should be initiated against this tendency. The Latifabad Taluka Municipal Administration should evolve a comprehensive and sustainable strategy to maintain these green belts for the coming generations. It would also be advisable to install a gate clearly demarcating the Latifabad vicinity. The illegal extension of houses should be discouraged and checked immediately. Construction in the restricted areas indicated by the taluka nazim should be implemented in letter and spirit to keep Latifabad as modern, green and peaceful as it is now. Although Latifabad faces all the problems that other areas in Hyderabad do, such as submergence during monsoons of certain low lying areas within the district, these problems should be smoothed out to provide an even better place of residence to future generations. I am using the word 'horrific' here deliberately, because what else is the killing of innocent civilians in Iraq and Afghanistan by British bombing, missile strikes and other military action? What Britain and its American ally have been doing in Iraq and Afghanistan for years can only be described as state terrorism on a massive scale. Britain's actions in Iraq and Afghanistan are of a piece with many of the policies it pursued as a global colonial power in the 18th and 19th centuries. Whenever anything new was proposed, including even the abolition of something as inherently evil as slavery, the reaction of many of the British governments and parliamentarians of the time was to say: "Nothing good will ever come of it." As the English writer Phil Mason has observed, "We are accustomed to seeing the 'march of history' as a relentless story of social advance, the unstoppable crusade of reason eradicating the iniquities and unfairness of earlier, less enlightened ages." Although not surprising, it is nevertheless still rather odd, because if we thought about it we would know that our own world rarely bears any hallmarks of being a rational or deliberate progression towards a better tomorrow. As Mason has observed, "Bad ideas get accepted because of a temporary majority in their favour; good ideas flounder because they get poorly presented." But what is bad? What is good? It is in order to wipe out this confusing uncertainty that the picture of the past we create for ourselves has always tended to have an air of inevitability and purpose about it, and that we have been moving consciously and determinedly from a poorer state of affairs to a better state of affairs: the march of progress. "To a modern mind," says Mason, "this feeling of being part of a constant uplifting progress is most commonly manifested by the expression of genuine disbelief that anyone could have seriously objected to aspects of life which we now take for granted - rights such as the right to vote secretly at elections; the right, indeed, for all to vote at all, women included; the right to education, and for it to be free; unemployment benefits, pensions, and all the other facets with which we pride ourselves today as the symbols of a civilised society." In their time, however, all these were issues of radical and unprecedented change. They were resisted by many through arguments that ranged from prejudice of varying degrees of rationality to the bizarre. As Mason has observed, "All innovations succeed through tireless advocacy by committed people. Our traditional histories make us familiar with them: Wilberforce against slavery and child labour, the Pankhurts for women's suffrage, Florence Nightingale for hospital reform, Elizabeth Fry for prisons." Less familiar, however, are the detractors, those who resisted the urge for change, those who thought that the very fabric of society was about to be torn forever in incalculable ruin - in other words, those belonging to the "nothing-good-will-ever-come-of-it-brigade." One of the best accounts of the doings of this brigade is the daily columns of "Hansard", the official record of Britain's Parliamentary debates from the 18th century onwards. A trawl through "Hansard" pays rich dividends, as the following examples from the long drawn out parliamentary debate on the slave trade show. The best estimates suggest that between 8 and 10 million Africans were shipped to the Americas; at its peak the trade carried 100,000 a year. On average, a plantation slave survived 10 years - if they managed to reach the Caribbean alive; death rates during the trip were often as high as a quarter of the complement. By every account, it was an inhumane business, but the battle against it was to be long and hard fought. Led by Wilberforce, who introduced motions on abolition in the British Parliament every year for two decades, it pitched a small band of moral campaigners against one of the most powerful economic forces of the day. Nineteen years were to pass between Wilberforce's first motion in 1788 and the eventual abolition, and a further twenty-five before slavery itself was stopped. In the United States of America, however, slaves were not freed until Lincoln's Emancipation Proclamation of 1863. One of the earliest lines of argument in the British Parliament against abolition was that nothing could make worse the lot of the existing slaves than an abolition of the trade. Speaking in the House of Commons in 1796, Sir William Young said, "Nothing I am persuaded could tend more to render the Negroes on the plantations discontented than an assurance that their labours were not to be alleviated by the arrival of assistance." This was a diabolically ingenious argument, because what it, in effect, suggested was that the only way to lessen the burden of the slaves was by bringing in more slaves to share the workload. This anti-abolition argument was given a new twist by General Gascoyne in 1805, when he said, "How impolitic then it is to raise doubts and questions in their (the slaves') minds upon the subject of emancipation, for to that this question ultimately leads and how pregnant with danger is such conduct to our colonial interests and possessions…Under these circumstances, it becomes the House to say at once to the world that they are resolved not to adopt a system which can only lead to the most injurious consequences and thus to put an end to discussions which have already and which evidently must have the very worst effect upon the minds of the Negroes." The diabolical equation was clear: you could not abolish slavery without immense ruin to the British planters in the Caribbean and the American planters in the southern states; and you could not abolish the trade without conferring moral obloquy on the practice of slavery itself - so the trade perforce had to continue in the interest of maintaining the security of the colonies. "Would the interests of humanity…be served by abolition? Certainly not," said Britain's Secretary for the Colonies, in 1799. "The trade," he added, "would still be carried on; the supply would be obtained with the difference that now the trade is conducted under the control and regulation of this House whereas then it would be carried on by other nations free from all the salutary and humane regulations enforced by the Parliament of this country." In other words, if Britain's Secretary for the Colonies were to be believed, slavery was "salutary and humane." The mind boggles at the thought. This argument was echoed by Sir Robert Peel (the elder) in 1806. Said Peel, "I doubt whether even a concurrent (i.e. all countries) abolition of the slave trade would erect the Utopia in Africa which the imagination of the abolitionists has projected; but a partial abolition, an abandonment of that small share which we now carry on for the sake of our old colonies and which we carry on under the strictest regulations for the prevention of abuses, cannot pretend to have the smallest effect towards that object. It has the double disadvantage of precluding the hope of our ever bringing about a concurrent abolition and of inviting our rivals to assume, as soon as they can, our place in the trade infinitely to the disadvantage of Africa in point of humanity." What Peel was saying here, in effect, was that, while it was okay for Britain to carry on the slave trade, it would not be okay for its rivals to do so. According to him, the slave trade in other hands would be "infinitely to the disadvantage of Africa in point of humanity." To talk of slavery and humanity in the same breath, evidently did not strike Peel as the grossest and most inhumane contradiction in terms. Kolachi: Where were you born? Javed: I was born in Rampur, which was an ex princely state in Uttar Pardesh, India. Kolachi: How long have you lived in Karachi? Javed: I migrated with my parents to Pakistan in 1964, and have lived here ever since. Kolachi: Tell us about your family, do you live with them? Javed: I currently live with my brother and sister in the same hosue that we had moved into originally. Kolachi: Have you pursued education? Javed: Yes, I went to the Bahadur Yar Jang Academy, and then the National College, I used to be in the evening shifts. Kolachi: Have you ever lived in another city in Pakistan? Javed: No- I have visited other cities for various reasons, but am a Karachiite through and through. Kolachi: Do you like living in Karachi? Javed: There isn't another city like Karachi. I know every nook and corner of my city. I believe I wouldn't be happy if had to live elsewhere. Kolachi: Why do you so firmly believe that? Javed: All my friends and relatives are here. Above all of that though is the fact that I have lived here since I was a child. I love everything about Karachi, if its hot during the summers I would still prefer being here, when it rains, I enjoy that. The weather in Karachi is never harsh. Kolachi: What kinds of work have done during all these years? Javed: A variety of jobs. I have worked for PTV, served in a business organization, had a brief brush with advertising and currently work as Resource Manager for a production house. Kolachi: How do you feel about the many problems that plague Karachi; load shedding, strikes, traffic jams etc? Javed: These problems should not exist in Karachi as it is the economic hub of Pakistan. Anything that goes wrong in Karachi affects the whole country. Load shedding above all maladies is the most injurious to business and commercial activities. Strikes, specially the pahiya jaam ones, are paralyzing. I wish Karachi could be rid of all this petty politicking for small causes. Kolachi: Don't you feel traffic jams are paralytic as well? Javed: These frequent traffic jams are the result of unplanned growth within a city. The same can be said of the other maladies that infect every aspect of our daily lives. The famous plan for a Greater Karachi was prepared for a population of 1.6 million only. But today, we have over 100 million people living in Karachi. Naturally, civic services such as power and water supply, sewerage systems, roads and other basic facilities arranged for less than two million cannot fulfill the needs of a population of a 100 million. Kolachi: Don't you think that Karachiites have some responsibility towards improvement and maintenance of available facilities? Javed: Certainly, but we lack education and training, without which we may never be able to recognize our rights and duties. Kolachi: What would you suggest then, as a common citizen? Javed: I suggest nothing. I simply love Karachi. Good or bad - it is our home. Karachi is, as Javed pointed out, a city that has developed without much planning. The borders of the city are ever expanding to accommodate the ever increasing population. It is a very instinctive love that he feels for his city, and despite the many infrastructural problems haphazard growth might cause Karachi and its citizens, he is a Karachiite to the core, and enjoys every quirk this city and its people have to offer. He has never considered living anywhere else, as he feels anyone who has lived for a long period of time in this mega city cannot help but like it, and would find it hard to live elsewhere. Allowing personalities to develop freely, but forging lifelong bonds, such is Karachi's character.